Once a person becomes owned by parakeets, whether a single or a flock, it is hard to think about leaving them for any length of time. But, humans frequently have commitments that take them away from home for more than a business day, whether that’s traveling for work, visiting family or even being in the hospital. On the other side of the coin, parakeet owners may still wish to take either short or long trips for pleasure and I think that’s okay. Having any sort of pet doesn’t necessarily mean you should never want to leave your home again! But, the question is, how long can parakeets be left alone safely? I don’t think that parakeets should be left alone for more than a weekend, or two nights. There are too many things that can go wrong and even though none of them may have ever happened, you can’t predict the first time your flock will have a night terror. Or when your parakeet is going to get stuck in a toy and need help getting out. Or when they will decide to bathe in the drinking water, or throw all the seed out of a bowl. Even if none of this has ever happened before it could the moment you step out the door for your first weekend away! That all sounds pretty dire, and sort of conflicting with my belief that having parakeets shouldn’t chain you to your home! The way I live it is that the parakeets are never alone for more than 24 hours, that’s what I’m comfortable with. Anything greater than that and either my mom comes over, or if she’s unavailable the professional pet sitter comes. Having these resources is key, and I highly recommend working out a plan for who can take care of your parakeets before you actually need them! That way in case a medical or other emergency takes you away from home you’re just a phone call or text away from having your parakeets care covered. 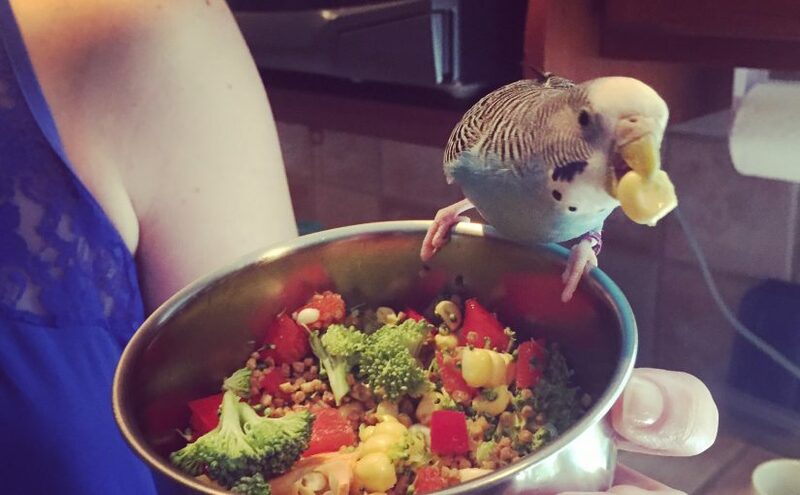 There are steps you can take before going away to reduce the likelihood of disaster and assure that your parakeets are almost guaranteed access to food and water. One is to look at your cage with a critical eye, if there are any toys with small crevices, or ropes that a little parakeet foot could get stuck in, swap them out for something else. Also, think about their routine, are they used to having you close curtains for them every night? Would it be scary for them if the curtains were left open? If that’s the case, you may wish to keep them closed and use Light Timers to signal morning and evening. In general I think light timers are a good thing to use while on vacation or otherwise to build a routine. Additionally, your parakeets will almost certainly miss the noise and bustle of the humans in their household – so make sure to leave the tv or radio on, or better yet, an Amazon Echo . Using the Amazon Echo I can turn music on for the parakeets when I get up in the morning and turn it off at their bedtime, no matter where I am. It helps them keep their usual day time rhythm. If I had a smart home I could also use the Amazon Echo to adjust lighting and even heating and cooling. A way for you to feel better while you’re away is to invest in a Wireless Security Camera – using the camera with its app on a smart phone you can take a peek at your parakeets either day or night and make sure they are A-Okay. You can even use the camera’s microphone to talk to your parakeets. For both food and water – Stainless Steel Hanging Bowls , these are non-porous (as opposed to plastic) resist staining and are good at reducing the slimy or scummy feeling on the inside of a plastic water bowl. They are also very easy to clean. Silo Bird Feeder – this reduces the likelihood of all of the food being compromised by poop or kicked out of a bowl. Although it probably does not reduce the chances to zero. I would have this in addition to bowl(s) of food. Silo Waterer – just like the silo feeder, this helps ensure a clean source of drinking water that is much less likely to be contaminated. Lixit Bird Waterer – 5 oz – Either in addition to the silo and bowl of water or instead of the silo. There is a greater risk of mechanical failure with these because the ball can get lodged in the metal tube, meaning it could be full of water without the ability to actually dispense any. These also require fairly frequent cleanings due to slimy buildup, and you have to be very careful to clean thoroughly, which isn’t easy because of the small size. 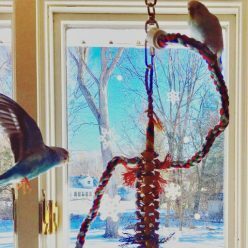 The first time you leave your parakeets is bound to be nerve-wracking. Once you’ve got your systems in place for feeding and watering, and you feel good about their physical safety it does get easier. Ultimately the question of how long can parakeets be left alone is a very personal one and depends on what you are comfortable with, there aren’t any easy answers! Yes, it’s okay for a single parakeet to be alone while you are at school, but I would definitely recommend leaving music or the television on for them for some company! Next Next post: Clipping a parakeet’s nails – mission success!